I'm not even sure what sort of joke to start this one off with. How bout "if the bottle says vintage on it, just how old is this soda? Is it out of date?" Alright that was pretty awful. Black cherry always seems to be decent. You can't really screw up a black cherry. Actually you probably could, but this one hits the mark for the most part. It has a good black cherry flavor, but a little light than what you may expect from most. Along with a good bit of sweetness (real cane sugar in this one) it also has a slight bite to it, something I never have had in a black cherry before, and I'm enjoying it. The carbonation feels a little overpowering at times, but if it were any other soda I probably wouldn't even make that comment. I prefer my black cherry sodas to be smoother, and this is a case where that would improve it immensely. After drinking this on the Popcast, I capped it up and put it in the refrigerator. When I came back to it, it was just slightly flatter, and it made a world of difference. That's not how it comes in the bottle though, so I stick with my original decision. The ingredients are fairly solid, as I said no HFCS, but there is sodium benzoate. 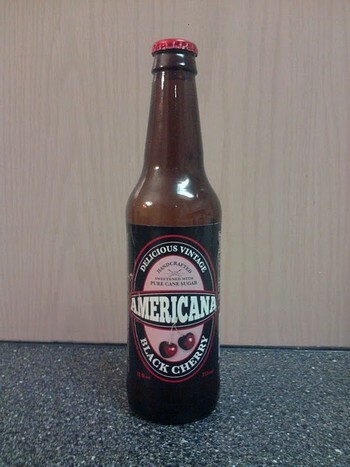 The cherry taste comes from dark sweet cherry extract, which sounds like it could be bottled on it's own. Aside from the ink on the label rubbing off on my hands as I drink it, and it's slight over-carbonation, this is a fairly solid black cherry with a unique bite to it.